Game driving you potty? Have a look through our guide. 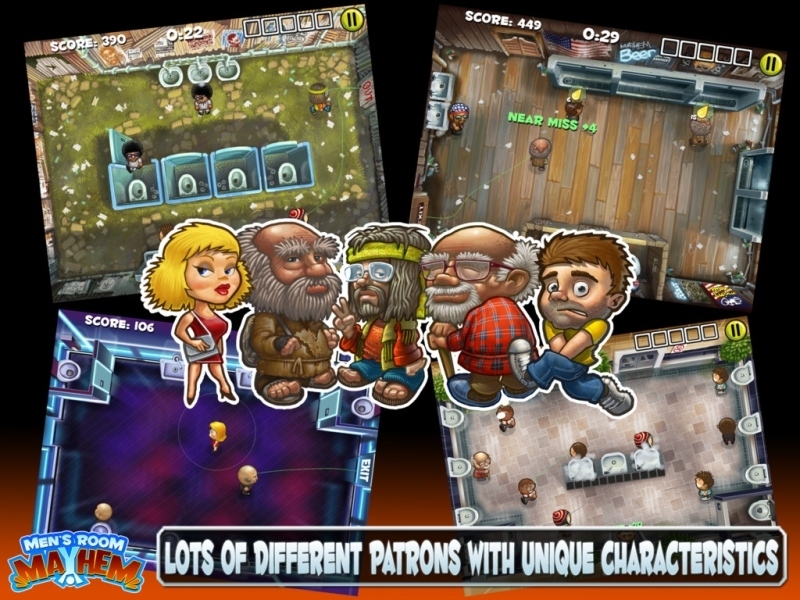 Men's Room Mayhem is out now on the App Store, and we gave the game a resounding 4.5 out of 5 score in our review earlier today. 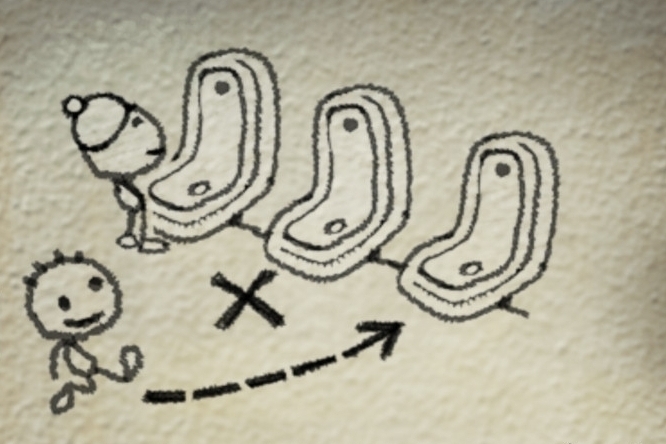 If you're struggling to maintain appropriate manly etiquette in the game's many restrooms, have a look through our useful tips. - It's not a very pleasant thing to do, but slow-moving characters are your worst enemies in the game, and they can easily end up shambling into another customer and starting a fight. Consider directing them towards a urinal or toilet nearest the door, then getting them out through the exit as soon as possible, without washing their hands. We know, we know. - In order to unlock new restrooms, you need to complete certain objectives in exchange for medals. You can view these before a game or by hitting the pause screen. If you just want to unlock new rooms quickly, you don't have to finish off a game completely. Just complete the mission objective, then quit out of the game. They'll still be tallied up. 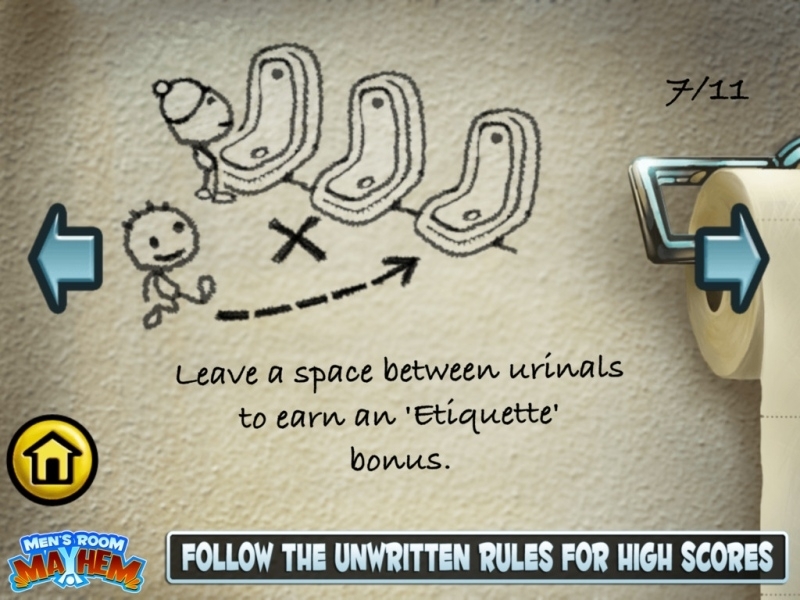 - The perils of men's room etiquette are many - in game and in real life. As a general rule, distance means privacy, and privacy is king. Whenever you move characters around the screen, give the chaps as much distance from each other as you can. This applies to where you place them for the job at hand, and where you move them onto for the next one. - For the most part, it's worth grabbing every last bonus you can, but bear in mind that five fights will result in a game over screen. Up until Wave 5, you should have no trouble directing people to where they need to go, keeping them hygienic with hand-washing, and seeing them out of the door. In later waves, you might want to cut a few corners for the sake of keeping the game going. - Make sure you clean up on bonus points when you're cleaning up between waves. You might think you're meant to scrub the toilets and floors one by one, but you can in fact do a whole row of them in a series of sweeping motions. Rub your finger frantically across an entire row of cleaning jobs, and you should have no trouble getting every last bonus within the short time limit. - If the restroom you're playing on has an exit and entrance side by side, steer customers around the screen in a circular fashion from toilet, to wash-sink, to exit. That way you minimize the risk of anyone getting into a scrap. At the same time, try to observe distance etiquette wherever you can for a few precious bonus points.